I’m thrilled to welcome back my Blue Eyed Cowboy this week to chat about the events that have been going on our life. Making the transition from hands on parents to empty nesters has been quite a ride as he’ll tell you! Father of the four children we homeschooled he brought his guitar, his imagination and his unique way of telling bedtime stories to the kitchen table. His glamourous life caught the children’s attention a whole lot quicker than anything I was trying to do with them! 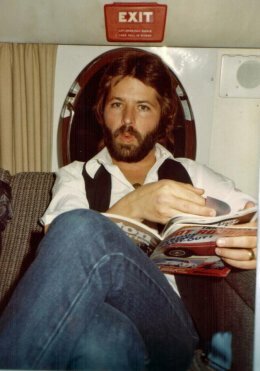 “What was it like travelling on a private jet with the Bee Gees?” is a must know for young, impressionable teens and my cowboy spent many a happy hour regaling them with wild and exciting stories from his career. Today though we’re not going to be talking about his job, or how he fell in love with me on first sight, you can find those conversations in the archives, today we are going to be exploring the question, “are we ever too old to move back home?” Tune in this Friday at 12 noon CT for an amusing and light hearted look at our homelessness! I’ll also be talking about Canterbury, Deep Purple, the final move, and some things digital. I’m drinking sparkling water today since it is a wee bit hotter than it was in England and I need refreshing at this noon hour! As all my postcards used to say, “I wish you were here,” but at least you can hear me spouting on while you sit comfortably. Let’s begin shall we?